I’ve personally wanted a war with Iran since the abdication of the Shaw. Anyone that wants war is unhinged and messed up in the head. The atrocities and near annihilation of Zarathustrans demanded then and demands now a reckoning. If we are taking out country's based on atrocities then I assume Saudi Arabia is on your hit list? No he didnt! What an asinine take on the situation. Sorry but no, that was just your government lying to you. because they are and we've been their target for decades, people forget how many Americans they've killed over the years through their proxy hezbollah, hamas and various other terrorist organizations. 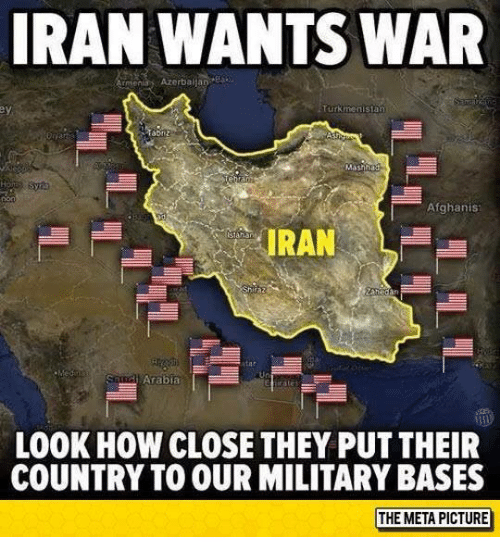 iran has been waging war against America for decades and we've always done nothing about it, real war is inevitable with iran as soon as they push too far. sensational images don't mean anything when the information is outdated, many of those bases were shutdown years ago and the ones still open are mostly not near the iran border, nice shock value but only idiot's take pictures at face value. Actually, trump supports and DO what exactly his masters ordering him to DO In that case AIPAC.. Israelis.. are all his boss…. edit on 11 4 2019 by Qboneq because: double posts..